Author(s): Xiaoai Wu, Huawei Cai, Ran Ge, Lin Li, Zhiyun Jia. Department of Nuclear Medicine, West China Hospital, Sichuan University, No. 37 Guo Xue Xiang, Chengdu, Sichuan (610041), PR China. Parkinson’s disease (PD) is a common progressive, neurodegenerative brain disease that is promoted by mitochondrial dysfunction, oxidative stress, protein aggregation and proteasome dysfunction in the brain. Compared with computer tomography (CT) or magnetic resonance imaging (MRI), non-invasive nuclear radiopharmaceuticals have great significance for the early diagnosis of PD due to their high sensitivity and specificity in atypical and preclinical cases. Based on the development of coordination chemistry and chelator design, radionuclides may be delivered to lesions by attaching to PD-related transporters and receptors, such as dopamine, serotonin, and others. In this review, we comprehensively detailed the current achievements in radionuclide imaging in Parkinson’s disease. 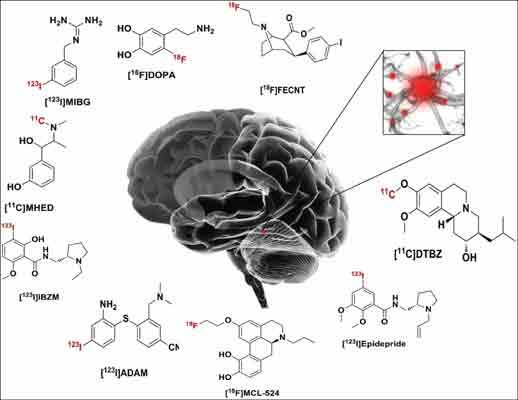 Keywords: Neurodegenerative, Parkinson’s disease, radiopharmaceuticals. Affiliation:Department of Nuclear Medicine, West China Hospital, Sichuan University, No. 37 Guo Xue Xiang, Chengdu, Sichuan (610041), PR China. Abstract:Parkinson’s disease (PD) is a common progressive, neurodegenerative brain disease that is promoted by mitochondrial dysfunction, oxidative stress, protein aggregation and proteasome dysfunction in the brain. Compared with computer tomography (CT) or magnetic resonance imaging (MRI), non-invasive nuclear radiopharmaceuticals have great significance for the early diagnosis of PD due to their high sensitivity and specificity in atypical and preclinical cases. Based on the development of coordination chemistry and chelator design, radionuclides may be delivered to lesions by attaching to PD-related transporters and receptors, such as dopamine, serotonin, and others. In this review, we comprehensively detailed the current achievements in radionuclide imaging in Parkinson’s disease. Commentary: Gut Microbiota and Brain Function: A New Target for Brain Diseases?